The Oom PaPa Marching Band is a home-spun favorite. The band also welcomes flag and banner holders and younger children who walk behind holding small American flags. Re- hearsals will be held at Pampas Ricas and Ocampo on Saturday at 10:30 a.m. and Sunday at 6 p.m. “The evening before the parade, we march through the Hunting- ton and everybody comes out to greet us,” says Schlessinger. 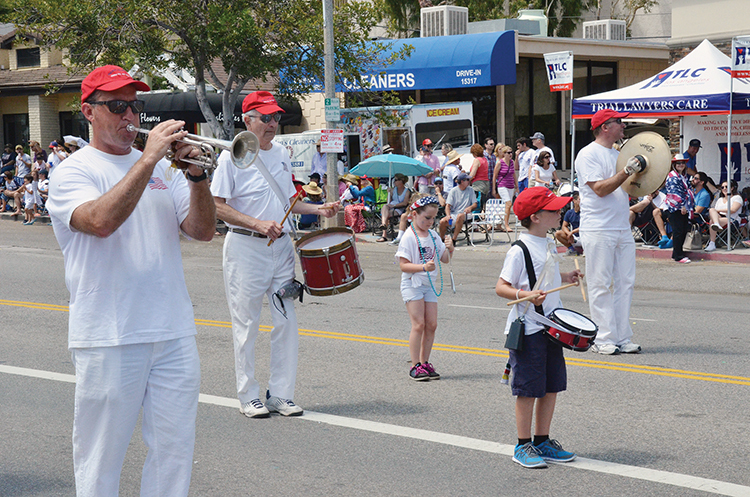 Wearing their white shirts and red hats, and led by veteran drum major and band director Mark Eisenberg, the band will play “76 Trombones,” “You’re a Grand Old Flag” and “Louie, Louie” in the parade. For information on joining the Oom PaPa Band, contact Phyllis at (310) 613- 0194 or Margot at (310) 459-3516.